Gorgeous Matte Striped Thick Glass Vase. Tall Glass Vase. 19 3/4 " Tall x 5" Wide - 5 1/2 lbs. (2 Available if Desired). It features an art deco style with long oval opening - one in frosted light pink, one in clear frosted. "TWO'S" on the bottom (does not show up in pic). Up for sale here is a signed Vitrix Thomas Buechner Blue vase with crystal handles which is a trademark of Vitrix. Beauchner is one of the great Glass Blowers who works at Vitrix. The vase is Blue in color with crystal glass twisting around vase. Tha vase has a very small chip (photo # 12). Up for sale here is a signed Vitrix Thomas Buechner Red vase with crystal handles which is a trademark of Vitrix. Beauchner is one of the great Glass Blowers who works at Vitrix. The vase is Red in color with crystal glass twisting around vase. Up for sale here is a signed Vitrix Thomas Buechner Green vase with crystal handles which is a trademark of Vitrix. Beauchner is one of the great Glass Blowers who works at Vitrix. The vase is Green in color with crystal glass twisting around vase. T29 hand BLOWN GLASS VASE w/bubles AMBER & CLEAR GLASS 8.5"
#T29 BLOWN GLASS VASE AMBER AND CLEAR glass w/buble in the GLASS CENTER PIECE. IT HAS NICE BUBBLES IN THE GLASS. Art Glass Mt Saint Helen's Studio, WA. 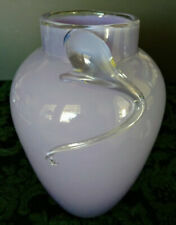 Amazing clear cased lilac color, with a great tadpole climbing motif. (Used in Art Glass since beginning!). Not sure what the deal is, however the person who made this gem/beauty certainly knew what they were doing! Art Glass Swirl Round Bowl - Vase - Rose Bowl - Candle Holder - Mosaic Clear Gold & Red. Doing my best to make it in this world. Now, in my early fifties, I feel almost retired. Even though E-bay is a lot of work. Doing my best to make it in this world. Now, in my early fifties, I feel almost retired. Even though E-bay is a lot of work. I want each sale to be a pleasant experience for all. I am easy to get along with. Cobalt Blue Snake Spiral On Clear Thick Heavy Art Glass Vase 14 1/4"
It weighs 4 lbs. It is 14 1/4"high, 2 1/2"across the top, and 5" through the thickest part. Cobalt Blue Snake Spiral On Clear Optic Art Glass Vase 7 1/4"
This is for a gorgeous Cobalt blue spiral on clear, vase, in very good condition. It does have a small nick on the side, if you look for it. The vase is cut off at the top, not the bottom. It is 7 1/4"high, 2 1/2" across the top, and 6 1/4" through the middle.